Envisioned as a general purpose cryptocurrency for use in everyday digital services, Kin will be used for all transactions within the Kin Ecosystem. Implemented on the public Ethereum blockchain as an ERC20 token, Kin will serve as the basis of interoperability with other digital services in the Kin Ecosystem. Through the Kin Rewards Engine, Kin will be introduced into circulation as a daily reward, to be distributed among stakeholders by an algorithm that reflects each community’s contribution to the overall ecosystem. Kin shows a perfect example of a blockchain/decentralized project headed by an already experienced and successful company. We’ve seen several companies venture into blockchain tech, already being successful with their own centralized projects and these are the ones that get us the most excited. Startups are hard to pick in terms of if they’ll be successful or not but things are made slightly easier when we can take a look back at previous success. In Kins case, Kik was the previous success. If there is a team operating in the blockchain space that is fully adept in social interactivity and incentivized activities, it’s the team behind one of the most downloaded chat/social apps on the app store. Kin has been by far one of the most professional companies operating in the blockchain space that we have seen over the past 2-3 years. It’s refreshing to see a project constantly concerned with investor sentiment without pumping up the price of a token by listing on random exchanges just to push volume. Kins ICO was held in September of 2017 and although they haven’t been rushing to get the KIN token added to popular exchanges such as Binance or Kucoin, they’ve been putting every effort into creating a working and user-friendly ecosystem which at the end of the day is the most important thing. Kin was originally built on the Ethereum network but it was eventually decided that the Stellar blockchain was a better candidate due to greater network capabilities. The Kin Blockchain is a fork of the Stellar Chain and statistics for this fork can be viewed here. By far one of the most impressive things that KIN has shown is it’s ability to grow and develop a user base. Right now (August 2018) the Kinnit App is the only publicly available app which uses the KIN token as a reward incentive. This app is only available to Android users located in the USA. With these restrictions in place, Kin has already seen over 150k accounts created with an average Daily Active User base of nearly 10k. 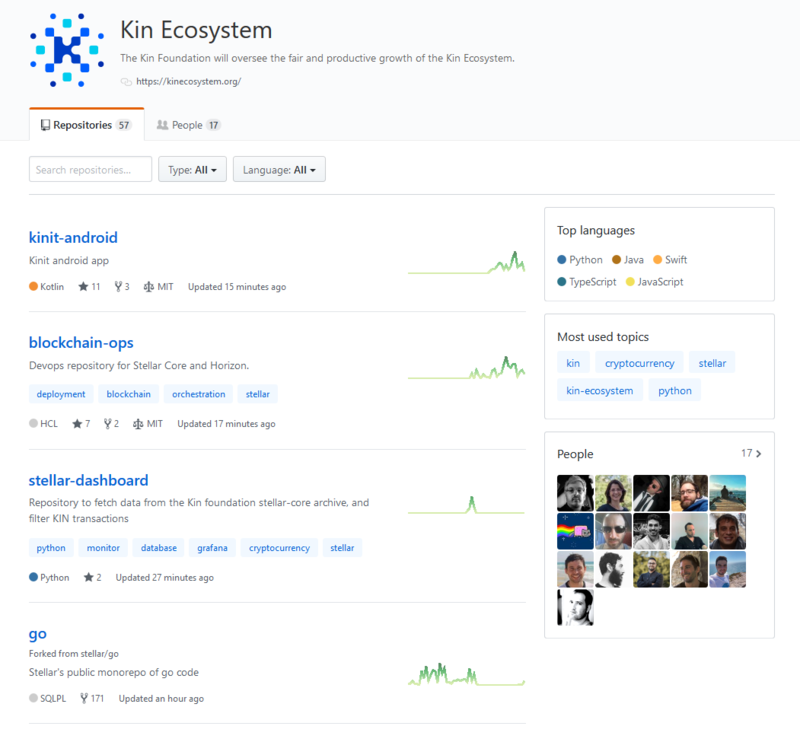 Kin is by far the fastest growing blockchain app that we’ve seen, period. From an investors perspective, Kin represents one of the best opportunities to enter a project at ground level. In terms of potential valuation, the applications that Kin can be integrated into make this extremely hard to pinpoint. Kin already has 40+ developers working hard on integrating the currency into their own apps, this includes AddMe, Nearby, Rave, Vent and so many other apps with millions of users combined. This is all without mentioning Kik, which will eventually integrate the currency, too. Kin is taking on a huge task but luckily they’ve got the technique and experience to handle it. When you take into account the enormity of the project you can see that Adoption will play a huge role in whether KIN is successful or not. Being a sort of “General” currency in terms of functionality, the complexity could be copied/replicated by another competitor BUT, we feel as though any competition would soon run into a barrier when they realize how complex the project actually is from an interactivity/adoption level. Kin is working hard, no doubt about it. If they keep it up, this shouldn’t be too concerning for long. You’ll see people throwing FUD around about the Total Supply of KIN. Set at 10 Trillion tokens, many investors are thrown off by market-cap valuations and other random statistics that don’t really represent the value of the token. What investors need to understand is that this Total Supply is completely necessary if KIN is going to garner large-scale adoption. The last thing Kin needs is their currency being divisible far to early which would result in people working in decimal points, something currencies such as Bitcoin and Ethereum are currently facing. Not user friendly at all. The other concern people have is how fast the Circulating Supply will increase as KIN leaks into it over time. This is a valid concern due to this having a direct influence on KINs price. Increased availability = Decreased scarcity/rarity. This is probably the only actual concern we can see people having, from an investors standpoint at least. This has no impact on the functionality of the ecosystem. We always try to list a least 3 concerns that we have about a project. In KINs case, we really don’t see any “red flags” showing up in our research. Everything Kin has done thus far has been careful and calculated, professional, that sort of thing. Kin has a long way to go on it’s way to being a top 10 Cryptocurrency but in the grand scheme of things, it’s probably the most likely “currency” coin to penetrate the top 10 in the next 2-3 years. We’ll update this section should any more concerns arise. • Token Use: Rewards & Social Payments.